A flower I spotted in the Old Northeast. my neighborhood in St. Pete, earlier this week. Whenever I tell my grandma I’ve been super busy, she responds with the same advice. “I know, I know,” I tell her, rolling my eyes. Slow down? Yeah right. The other day, though, I followed her advice. Literally. As I was running, I saw a flower that was calling for attention. 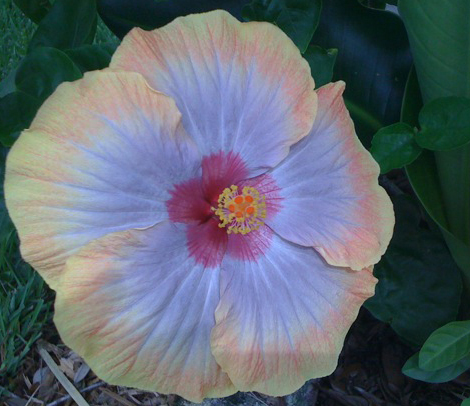 It had perfect purple petals with a hint of yellow on the edges and a bright pink center. I stopped to catch my breath and studied it for a minute, wishing it was more fragrant. As sweat dripped off me and fell onto my phone, I snapped a photo of the flower. Click. I’m always running — figuratively and literally. My mind regularly races with thoughts as I think ahead to the next hour, the next day, the next week. I’m like the Energizer Bunny, always going, going, going. I can relax more when I’m with others but it’s a lot harder when I’m by myself. I spend much of my alone time focusing on food and exercise to the point where it’s hard to focus on anything else. With time, I’m learning to find a new focus and slow down. My grandma helps remind me of the importance of this. She lives out the cliche she preaches, literally stopping to smell flowers when she sees them in the grocery store or when she walks by her garden. Because she’s older, she naturally walks slowly and couldn’t move fast even if she wanted to. Old age has forced her to slow down. Sometimes, we have to force ourselves to do the same. The more we stop and relax, the more we realize that we can afford to take breaks. We start to become more aware of how we feel when what we want to do conflicts with what we feel we have to do. We pay more attention to the uneasiness we feel when we start surfing the Web at night only to find ourselves doing work we should have left at the office. We try remind ourselves of the joy we get out of shutting off the computer and watching a funny movie, or curling up with a good book. We slowly begin to see the value in taking a breath, a break. We’re not always going to make time to stop and smell the flowers. When we do, though, we just might start seeing all we’ve missed.